In the bleak dystopia described in George Orwell's book 1984 the author describes how the state would control truth, deleting individuals and events from history. A person deemed irrelevant might become an 'Unperson' and 'vaporized'. Vaporization would not only include their physical destruction. Such people would also be erased from history with any mentions in books, newspapers along with photographs and film being consigned to the bin. Any trace of such individuals would no longer exist. To further manipulate the general public the state would engage in a process of twisting words and language. Referred to by Orwell as Newspeak, it has also become known as Doublespeak. The state would employ such methods to deliberately disguise, distort, or reverse the meaning of words. Orwell's book was written as a warning and fictional account of how a totalitarian state might engage in control its people and scrubbing consigning contentious events from the history books. But today, some 64 years after Orwell wrote his novel, one could be forgiven in thinking it was written as a proposal or blueprint for leaders and dictators. Even in western democratic societies there are examples of the dystopian vision imagined by Orwell. There may not be cameras trained on the public through their 'telescreens' or televisions, though there is virtually constant surveillance through CCTV and ANPR systems, while Internet monitoring and cellphone tracking is becoming all too real. Doublespeak can also be seen, taking the form of euphemisms, such as "downsizing" for layoffs, "servicing the target" for bombing, or "collateral damage" for civilian deaths. Such terms are usually employed to make the truth less unpleasant, rather than covering up the actual truth. Intentional ambiguity is rare but there are occasions where government or official statements could be described as deliberately evasive or even untruthful. There are some states that have refined doublespeak and vaporization to a fine art. China in particular has developed techniques that are not only insidious but almost 100% effective. Vaporized individuals may not be put to death, but if required they can be quietly disappeared and any mentions be eradicated from all forms of media. Even where their existence cannot be deleted, the facts surrounding them is manipulated, distorted and controlled. Such is the case of Melissa Chan, the Al-Jazeera correspondent who this week became an 'unperson' and of dissident Chen Guangcheng whose names and any reference to it are being wiped from microblogs and online forums [CBS]. China refused to renew Melissa Chan's visa and press credentials, nor would it allow the news channel to send another journalist to replace her. It effectively forced Al-Jazeera to shut its Beijing bureau leaving the organisation unable to report directly from China. But the news was not widely reported in China. Few Chinese-language newspapers reported on the expulsion. Two exceptions were the Hong Kong-affiliated Ta Kung Pao paper from Henan province and the Global Times. 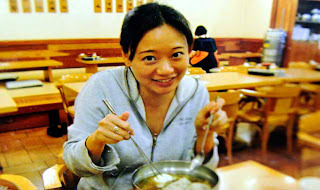 The article in the English language version of the Global Times was defensive of China's position and scathing of Chan's "aggressive political stance" claiming she had "a tense relationship with the management authorities of foreign correspondents" while insinuating she would "turn facts upside down" in her reporting. "Some media are only keen to show the wickedness of China to the world," the OpEd piece proclaimed, and insisted that "foreign journalists in China must abide by journalistic ethics." The state news agency Xinhua gave only scant mention of Chan's expulsion and the Foreign Ministry expunged any reference to the episode from the daily press conference transcript on its website despite dozens of questions having been asked of its spokesman Hong Lei. "I just want to know whether the expulsion of Melissa Chan should be seen as a warning to other journalists operating in China?" one reporter had asked. Hong's answer evaded the question with a claim that he had already addressed the issue. "I have just answered relevant questions. On the issue of foreign journalists our policies and moves are easy to see. We will continue to provide convenience for foreign journalists reporting in China and we welcome foreign journalists to report in China. At the same time we need to stress that foreign journalists should abide by Chinese laws and regulations, as well as professional ethics of journalists while reporting in China." Asked if and under what circumstances Al-Jazeera might be given press credentials and visas for a new reporter, Hong insisted the Beijing branch of Al Jazeera was "still functioning normally." Strange given that the news channel themselves had announced they had shut the bureau. Madeline Earp, an associate of the Committee to Protect Journalists, described Hong's explanations as "a mixture of denial and obfuscation... It was a convenient way to avoid being relevant himself." In 1984, George Orwell wrote about the 'memory holes' down which inconvenient documents were dropped to be erased from history. Melissa Chan's expulsion seemed to have become just such an inconvenient truth and has been dropped into a 'memory hole'. Outside of China Melissa Chan has not been censored, though she was initially rather quiet on her Twitter feed until her arrival back in the US . Her reports are preserved online however and can be viewed on YouTube [Link / Link] and via the Al-Jazeera website. The FCCC and the US State Department have both been a little more forthcoming on the matter. The FCCC said they were "appalled" by the move to expel the reporter while the US State Dept spokesman Mark C. Toner said the US was "disappointed in the Chinese government". "To our knowledge she operated and reported in accordance with Chinese law," Toner added. While the truth, reasons and details behind Chan's expulsion may never be known, there is much speculation. Chan's reporting on China would certainly have ruffled feathers. But her dispatches for Al-Jazeera were in many ways little different from those produced by Sky News, the BBC or CNN. In some ways Al-Jazeera was less high profile that these other broadcasters which have all aired highly critical reports on China's flaws. The BBC reporter Dammian Grammaticas and his cameraman were manhandled and arrested after attempting to film the so-called Jasmine protests in Beijing in 2011 [BBC]. Other reporters, photographers and cameramen were treated far more aggressively with at least one being hospitalised. CNN has also pushed the boundaries set by China. Stan Grant has on several occasions attempted to visit the blind dissident Chen Guangcheng and been met with violence or thuggery. Over the last two weeks authorities have stepped up their harassment of foreign correspondents. Over the weekend, police called in about a dozen foreign reporters, threatening to revoke their visas for allegedly breaking rules in reporting the case of the blind legal activist Chen Guangcheng by entering the car park of the hospital where he is receiving medical care [Independent]. Foreign press near to the hospital have undergone almost constant checks by police. However, as one Isaac Stone Fish suggests, those who appear to be Chinese often avoid such scrutiny. "Executives and reporters with Chinese backgrounds have many advantages operating in China," Fish writes. "Besides language skills and local networks, they can blend in a country where different color skin clearly identifies one as an outsider." Of course it does not always offer an advantage, Fish observes. "They seem to be given less leniency when they don't follow China's laws; like they're supposed to know better." While western looking reporters might enter the news bureaus hosted in two diplomatic compounds in the Jianguomen neighborhood unimpeded, Fish says he often saw foreign reporters who looked Chinese being continually checked for their ID. Such apparent prejudice can occasionally be seen elsewhere. At gated communities foreigners often enter unchallenged while those that appear to be Chinese are questioned and checked. Having the appearance of being Chinese would have given Chan an advantage of getting into places that a person looking clearly western would find difficulty accessing. Language skills may have also been an advantage. But her expulsion is more likely to be a warning. There appears to be a thinking that the throwing out a reporter from Al-Jazeera would attract little attention, while sending a stark warning to its larger rivals. If the BBC had been expelled, or CNN's Stan Grant been sent on his way, the ripples and critical voices might have been much louder. As it is, much of the criticism has been confined to a few sentences from those who matter plus a lot of commentary on the web. Al-Jazeera has given little coverage to the story, expressing its "disappointment" in a rather weak response on its website. On the day itself the news channel did not even mention the expulsion or closure of its Beijing bureau. In fact in terms of television broadcasts only CNN mentioned the expulsion. In 2010 China's Xinhua news agency opened a state-of-the-art newsroom at the top of a skyscraper in Times Square [WSJ]. CNC World, the agency's twenty-four-hour news channel, claims to "present an international vision with a Chinese perspective." Predictably, there was no word of Chen Guangcheng's plight as he languishes in Chaoyang hospital in Beijing uncertain of his future and whether he'll ever be allowed to fly to the US. The news channel also omitted to mention Melissa Chan. Also omitted by nearly every news organisation was the fact that other staff at the Beijing bureau of Al-Jazeera are left in limbo as their jobs remain at risk. The final word should perhaps go to George Orwell who himself said, "Journalism is printing what someone else does not want printed; everything else is public relations."